Romanesco cauliflowers are like jewels. Pretty fractal emeralds which call out to me from market stalls at this time of year. They seem so rare and precious that I feel the need to do them justice; more so than any other vegetable. I want to show them off in the manner they deserve. Small romanescos are magnificent steamed whole and served with a bechamel sauce which has had large chunks of stilton stirred through at the last minute (so that they're just beginning to melt but haven't yet disappeared...) and then topped with crunchy toasted pine nuts. On a quest for a simple dish befitting the romanesco but a little less artery clogging, I paired it with chilli and garlic to make a substantial week night dinner. It's nothing new or inventive - there are probably a million similar recipes out there - but it's a hearty bowl of bejewelled pasta that makes me happy. This will make enough for 2 hungry adults. Break the cauliflower into small florets and roughly chop the stalks into small pieces. Wash thoroughly. Finely chop the chilli and garlic. Bring a large pan of salted water to the boil. Cook the cauliflower for about 8 minutes until soft but not falling apart. Remove the cauliflower with a slotted spoon and set to one side (don't discard the cooking water). Bring the water back to the boil and cook the pasta according to the packet instructions. In the meantime, heat a wide based saute or frying pan. Add the olive oil and then the cauliflower. Saute over a medium heat, stirring often, until the cauliflower begins to break down a little. Turn down the heat and add the chilli and garlic and season generously with freshly ground black pepper and salt. Continue to for a couple of minutes, taking care not to let the garlic burn. Once the pasta is cooked, add it to the cauliflower, using a slotted spoon, along with 2 or 3 tablespoons of the cooking water. Stir in most of the grated cheese, reserving a little to serve (to make this dish vegan omit the cheese). Over the summer I signed up to Local Greens - a not for profit weekly vegetable bag scheme providing seasonal veg from small organic or spray-free farms, which are as near to SE London as they can find. To keep costs down, customers collect their bags from local pick up points (in Camberwell, Herne Hill and East Dulwich), rather than have them delivered to their door. The idea is to use the minimum packaging and transportation so that they can pay the farmers a good price for their produce. One benefit for me is that the veg has often been picked 24 hours or less before it makes it to my plate. The majority of the ingredients in this recipe came from my Local Greens bag a couple of weeks ago and I bought some gorgeous golden rapeseed oil from Bambuni in Nunhead so this turned out to be a thoroughly locally sourced dinner! It serves 2 hungry (greedy?) adults or a family of 3 or 4 if you reduce the amount of salt you use. Perfect for an autumnal evening meal. Peel and thinly slice the celeriac and potatoes (the easiest way to do this is in a food processor or using a mandolin, if you have either) and pop them straight into a bowl of cold water. Pat dry on a clean tea towel and then layer into a deep casserole dish, seasoning with salt and pepper and adding the garlic as you go. Pour the cream over the top and give the casserole dish a little shake to make sure it reaches the bottom layers. Sprinkle the cheese over the top (as much or as little as you like - I like a good layer!). Pop into the oven for around 50 minutes to an hour, or until the potatoes and celeriac are cooked and browned on top. Once the gratin is in the oven, put the oil and onions into a heavy based pan over a low heat. Cook the onions very slowly, stirring often, until they begin to turn golden brown (this will take around 30-40 minutes) and then add the sugar, thyme and season with salt and pepper. Cook for around another 5 minutes. Add the vinegar and cook until the liquid has disappeared. The onions should now be caramelised and a rich brown colour. Serve the gratin with a spoonful of caramelised onions and a crisp green salad lightly dressed with sherry vinegar and cold pressed rapeseed oil. A dish fit for a wedding! I'm not really sure when my fondness for smoked salmon developed. But develop it did. A treat for high days and holidays. Somewhere along the line it became more affordable to me and I've made many things with it over the years from pasta sauces to terrines and quiches to pates. But when faced with some good quality smoked salmon there is no better way to enjoy it than as it is. Simple and unadulterated. 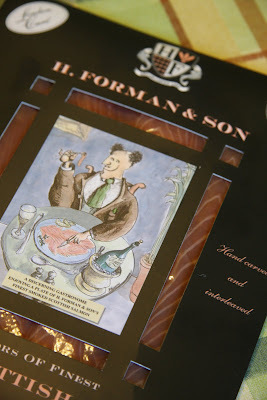 A while ago, the kind people at Forman & Field sent me some of their finest London Cure Smoked Scottish Salmon to sample. The Forman & Field founder, Harry Forman, devised this London Cure to show off the quality of his salmon rather than cloud it in smoke and they're spot on when they describe it as delicate, delicious and softly smoky. I've rarely tasted smoked salmon this good and wanted to do something with it which would allow it to shine. When Mr GG and I were planning our wedding a few years ago, good food and booze were (of course) fairly high up on our list of priorities. We worked with the caterers to plan our own menu which was seasonal and included a few of our favourite things (there's a song in there somewhere...). To start we plumped for Smoked Salmon with Blinis & Watercress. Simple and delicious. 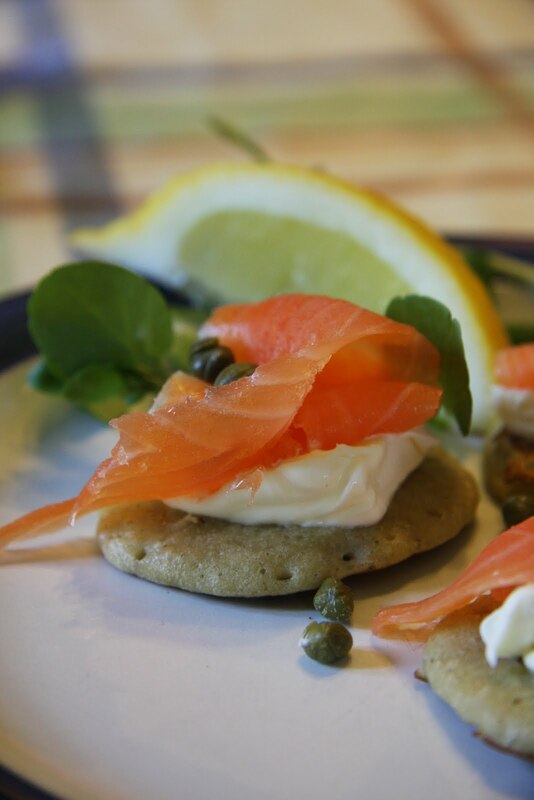 So with the London Cure Smoked Salmon I decided to have a shot at making blinis for the first time and replicate this wedding dish to make a light lunch for Mr GG and I to enjoy with my parents and my (not so) baby brother. I followed Richard Bertinet's recipe (from his book Crust) for the blinis with a couple of tweeks. To make the blinis begin by mixing the flour and salt in a large bowl. Heat the milk in a pan until it is just about to boil, remove from the heat and add the fresh yeast. Add the egg yolks and creme fraiche to the pan with the milk and yeast mixture. Add the milk mixture to the flour, stirring all the time, to form a thick batter. Cover and leave to rest for 1 and 1/2 hours until the batter has risen and looks bubbly. Whisk the egg whites to soft peaks and fold gently into the batter. Cover and leave for a further 2 hours. 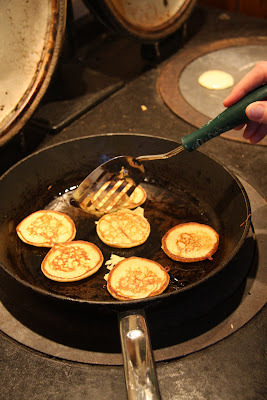 Richard Bertinet suggests cooking the blinis in oiled pans, but I found that the batter made better blinis by cooking them directly onto a dry non stick surface. Mum's simmering plate on the aga was best for this, but they also worked well cooked in a large non stick frying pan. Put spoonfuls of the batter into your pan (well separated so that they don't run into each other) and turn when the batter begins to form bubbles which will be around 30 seconds to 1 minute. Cook for the same amount of time on the second side and then leave to cool on a wire rack. 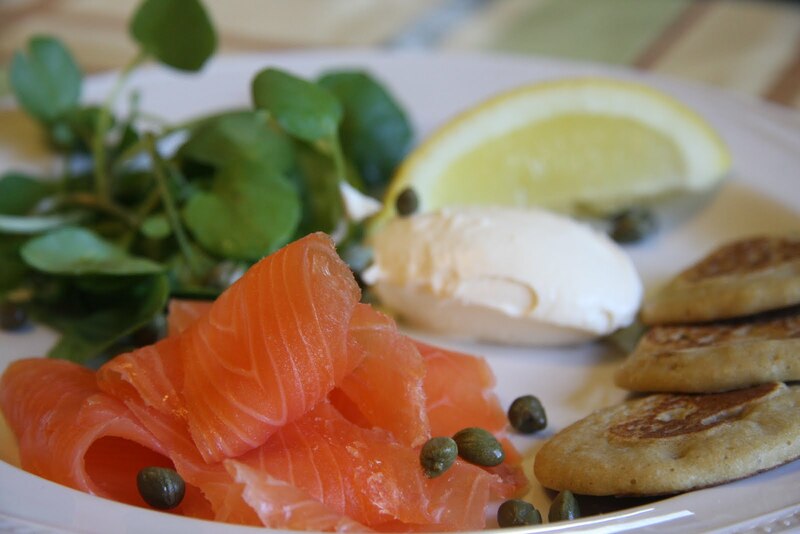 To serve, arrange some smoked salmon, watercress, a spoonful of creme fraiche and a teaspoon of capers on each plate along with 4 or 5 blinis. If you have any left over blinis layer them between baking parchment and freeze in a suitable container. You can buy Forman & Field's London Cure Scottish Salmon online here.